When I talk to managers I get the feeling they are important. When I talk to leaders I get the feeling I am important. One of the challenges for economic development professionals is to understand how to become an effective leader in a work environment where you have little directive control. Facilitation and relationship building are too often misconstrued for leadership. After accepting the role of Executive Director for the Ohio Business Development Coalition following my retirement from P&G, one of the first things I did was to determine what effective leadership looks like in the world of economic development. 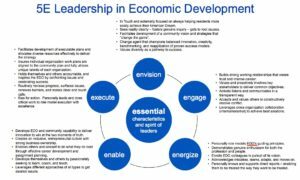 I am sharing my conclusions to help economic development professionals better understand what leadership really is and more effectively evaluate their personal mastery of this skill. Note, the model does not require a command and control structure. Effective leadership is all about setting a vision, engaging the right people, energizing them to achieve the vision, enabling them to be successful, and following through in developing and executing against a winning set of strategies. As an economic development professional, this is accomplished with influence rather than directives. I would suggest two uses for this leadership model. The first is as a guide for your personal leadership skill development. Take each of the factors in the model and assess your performance. You can do this by asking colleagues and people you work with to rate your mastery on a scale of 1-10 (with 10 being outstanding). Compare their score with your personal assessment to identify discontinuities. Then seek to understand why they see your performance differently than you do. This exercise will ope your eyes to meaningful opportunities for personal growth. The second is to make this model the standard for evaluating individual leadership during performance reviews. 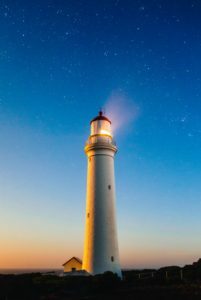 Nothing is more frustrating to an economic development professional than to be given the feedback he/she needs to be a better leader without providing a definition of what good leadership actually looks like. This model allows you to have a richer discussion and set specific behavior related skill development objectives. You may be amazed at how much more useful performance reviews are if you do this. I would like your thoughts on the model.